Dungeon is a good way to update players’ level and get better items. After your level arrive 10, you may go to dungeon and have a try. Each 10 level has a new dungeon, so there are 10 dungeons total in Call of Gods. 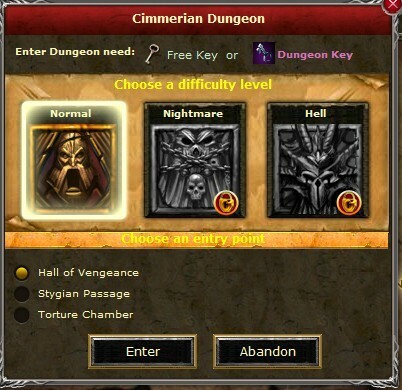 Each dungeon has 3 difficulties: normal, nightmare and hell. Players may choose the suitable level to have a try. Players can go to dungeons 6 times one day at most. And there are monsters, bosses, chests and unknown inside it. You may encounter many interesting things there. Enter the dungeons need dungeon key. Each day system will give you 3 keys free. And if you want to enter more, you many spend golds to buy them. Everyone costs 10 gold. So if you want to level up quickly and get better equips, dungeon is a good way for them, if you want to know more about it, please try it yourselves. And you will get more fun from it.